I've been very good this month and actually done my Crafty Creatives kit straight away. In fact I've realised I've only done 50% of the kits straight away - 5 of them, and of those 3 involved sewing and were my favourites, that should tell me something I think. I've been shopping recently buying more sewing stuff and one of the reasons I'm looking forward to having my craft room is that I will be able to have my sewing machine out all of the time on its own space on the desk. This is important because its heavy and whilst I can lift it up and down by myself I don't tend to much. It also means moving the computer out of the way which gets awkward if I want to do something which will take more than a couple of days. So most of the things I've sewn over the last few years have been handsewn, or quick items which only take a day or two at the most. Anyway back to my Crafty Creatives kit. 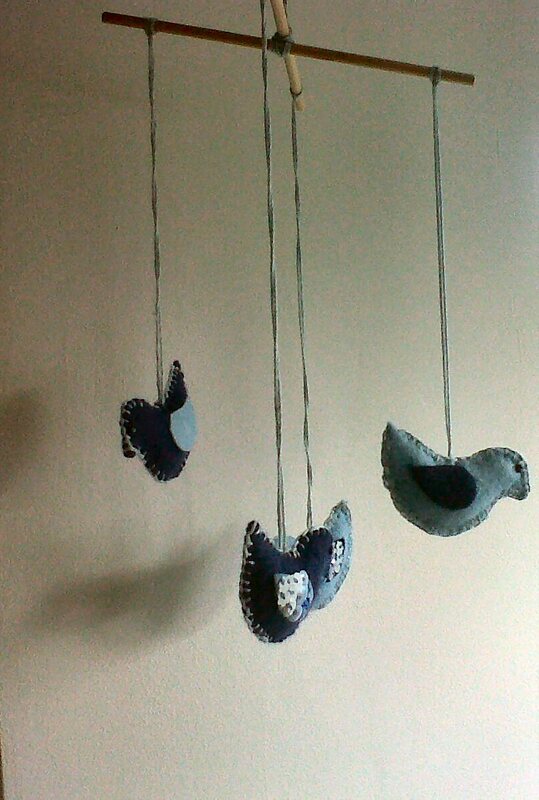 This months kit was to make a bird mobile. Its a pretty easy kit but I was doing it over a couple of evening's and I was tired and fuzzy brained and had to redo bits of it. Which explain why two of the birds have sequins on the wings and two don't. I was obsessive enough to count each type of sequin out and separate them into four for the four birds, but I then managed to sew them onto only four of the wings, enough for two birds. I liked the way they looked so decided not to unpick them and start again. 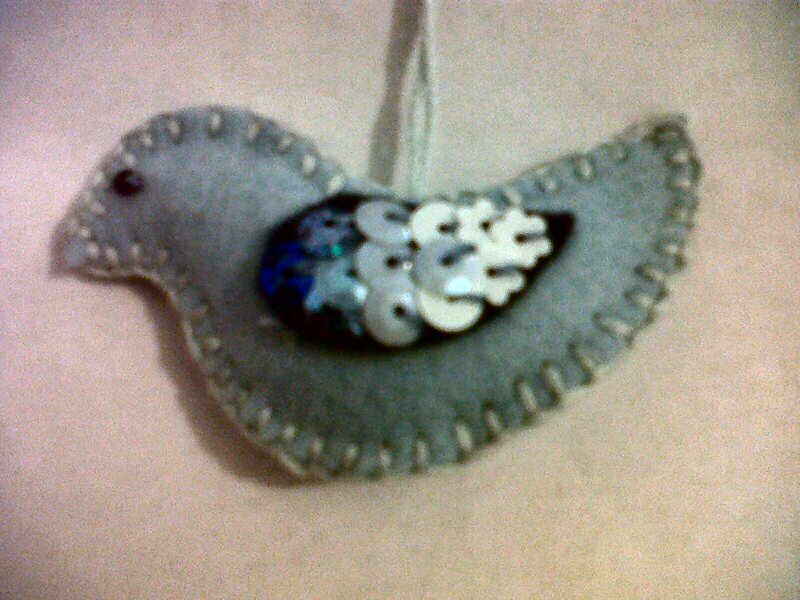 I tried to make the sequins look a little like feathers and I like the effect. I debated using beads or glitter on the other two birds wings, the box included both so it would have been easy enough but in the end I decided I liked them plain. Here it is, the finished object, I'm pretty happy with it. It looks like its hanging slanting but that's just the camera angle. I struggled getting a picture of it because I don't have anywhere to hang it up yet. Its going to go in my craft room but I wasn't going to wait that long to take a photo. It looks like something a five year old could have made better I know. 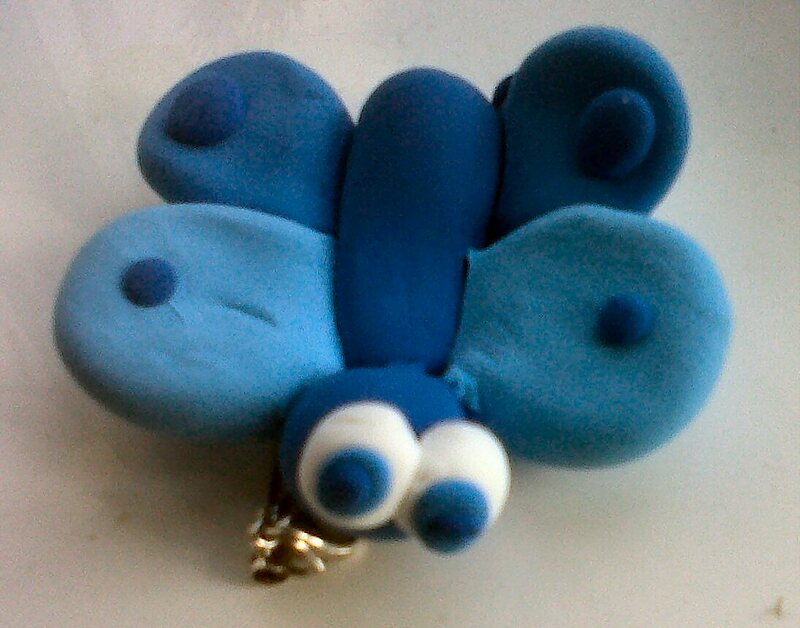 I wasn't great with clay at school either so I things like this aren't my forte. Good job I never wanted to be a potter when I grew up! 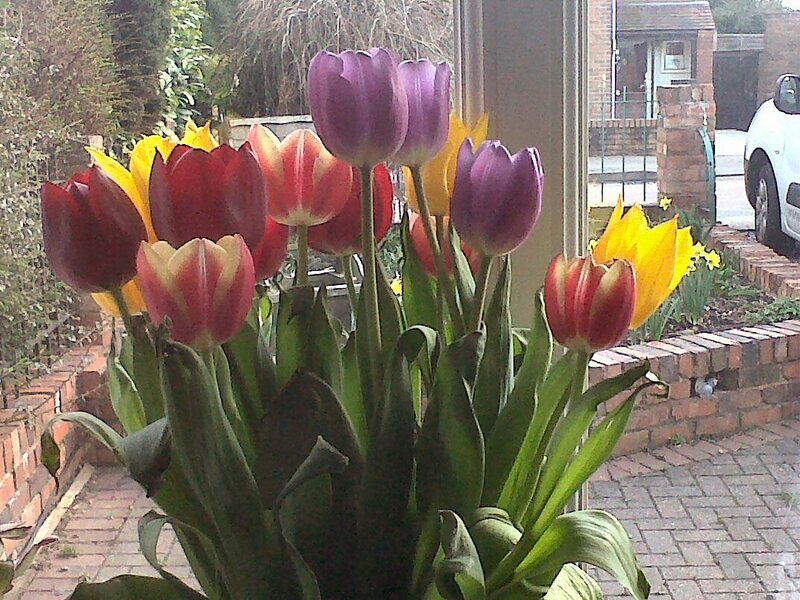 Finally when we got back home on Monday the Husbeast bought me some tulips, even though ti was his birthday. They are past their best now but still beautiful. These have made me happy every day I've looked at them, aren't they beautiful.